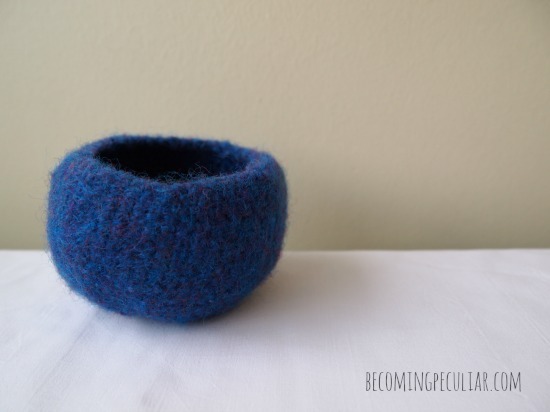 When I read Amanda Blake Soule’s Rhythm of the Family some time last year, I was immediately and completely smitten by her felted treasure bowls. They were adorable, and perfect for holding the types of things Lydia and I love to collect from nature. There was just one major problem: they’re knitted. I don’t know how to knit. I don’t know the first thing about knitting. 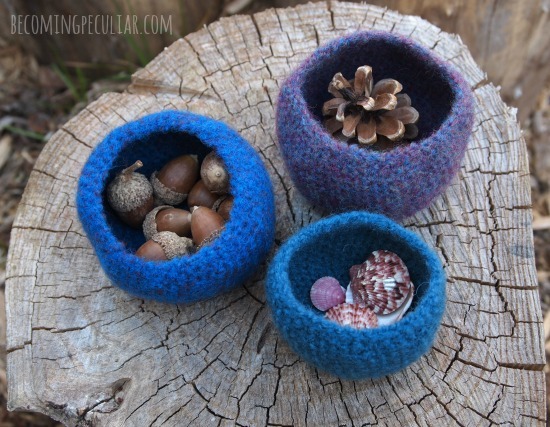 So I sighed and turned the page, never to create her beautiful little bowls. At the time, I didn’t know how to crochet, either. But during the five months we spent in the hospital with Felix, I got a chance to learn. And to get reasonably good at it, too. 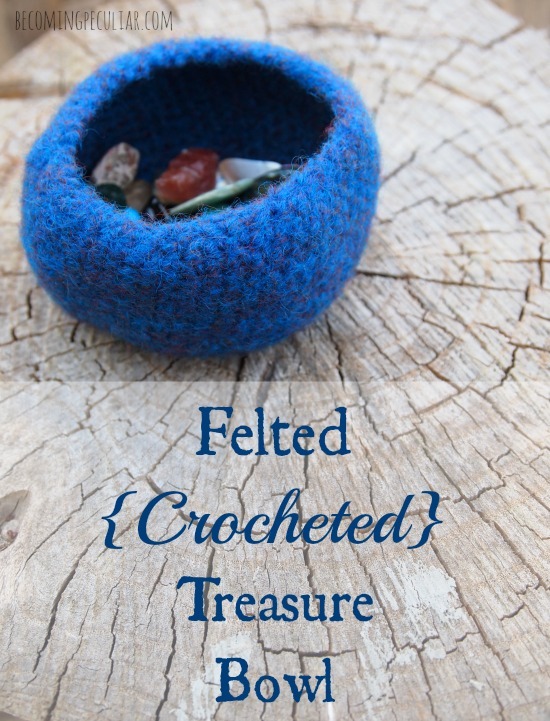 As soon as I learned to crochet in the round, Soule’s little felted bowls snuck out from the back of my mind. Maybe I could make a crocheted version? Didn’t it work basically the same way? It does! I’ve tried it. I tried to find a pattern online but I couldn’t find exactly what I was looking for. So I made up my own pattern and figured out how to felt it by checking out a variety of other tutorials. 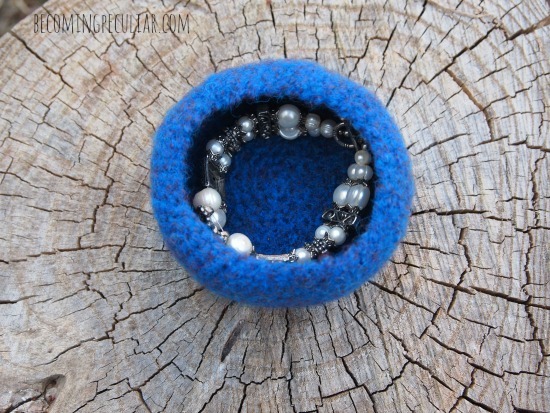 You need to use 100% wool yarn to create a felted piece. Felting is the process of the natural fibers matting together to form a dense fabric. Felting also causes shrinkage. 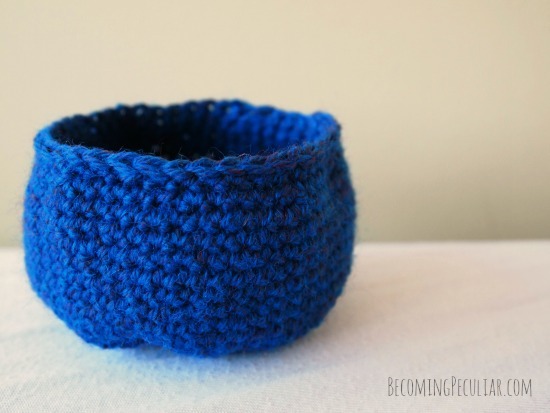 Your finished bowl will be smaller than the crocheted one you start with. I’m writing this pattern with the assumption you already know how to crochet. 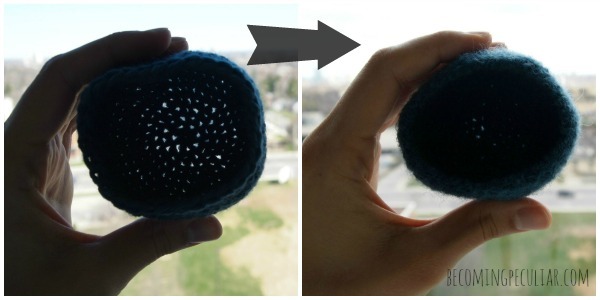 It just uses a magic loop and single crochet stitches worked in a spiral. You need to know how to increase and decrease. I started with this pattern for inspiration and tweaked it to suit what I had in mind. Start with a magic ring (a.k.a adjustable ring, adjustable loop). Make 6 single crochets into the ring. Pull tail to close ring tightly. (Alternative: chain 2. 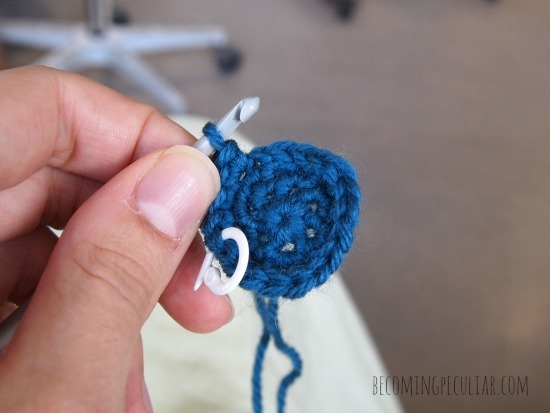 Make 6 single crochets into the second chain from the hook). Rnd 8-18: 1 sc into each stitch around. This is where your circle starts to turn into a bowl! 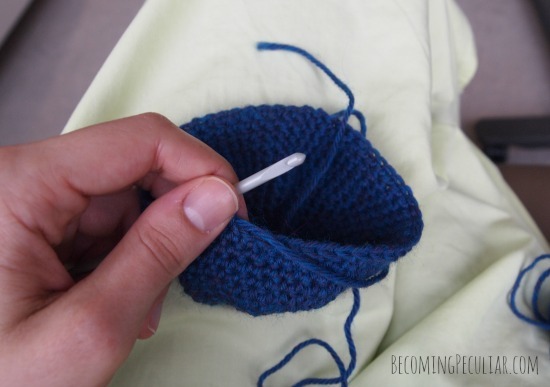 Use a slip stitch in the next stitch to fasten off. Trim and weave in ends. This step is fun after all the counting and precision and repetition of the previous step. To felt something made of wool, you need heat, water, and agitation. Soap helps, too. You want the fibers to all mat together to create a dense fabric. Some people use the washing machine to felt their work, and I would probably choose to do it that way if I had a bunch of bowls to do at once; but when I’m making one at a time, I’d rather just do it by hand. Under running hot water — as hot as you can stand — start to soap up your bowl and lather it. Then you just go to town on your bowl. Squashing, rubbing, scrubbing, massaging, wringing, and twisting. Rinse and repeat. Keep it up until it’s felted to your liking. I didn’t want to see too much stitch definition, but a little was okay. My hands get kind of tired, so I did it in two ten-minute-ish sessions. Then rinse with cold water to lock the fibers. Squeeze out as much water as you can. Wrap in a towel and squeeze some more. Then shape it with your hands and let it air dry. I put an orange inside mine for a few hours to keep it nice and round. 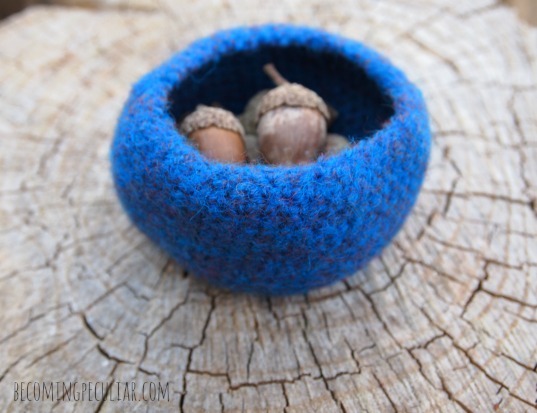 Tada: your bowl is felted! Adults can use them for their treasures, too! Hope you find these bowls as charming as I do! 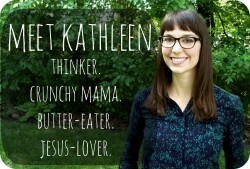 what a creative, inspirational person you are. These are so lovely! I’m saving your pattern for when I get better at crochet. :) Thank you very much! And I hope and pray Felix and your whole family are seeing things get better these days. I think I might need to learn how to crochet. But how are you doing? I hope you are having a lovely time of boringness. And by that I mean the kind of wonderful everyday kind of days people can have where in general things are going pretty well. Awesome pattern. Thanks so much! Would 110 yards be enough yarn for this pattern?